The Dr. P.A. 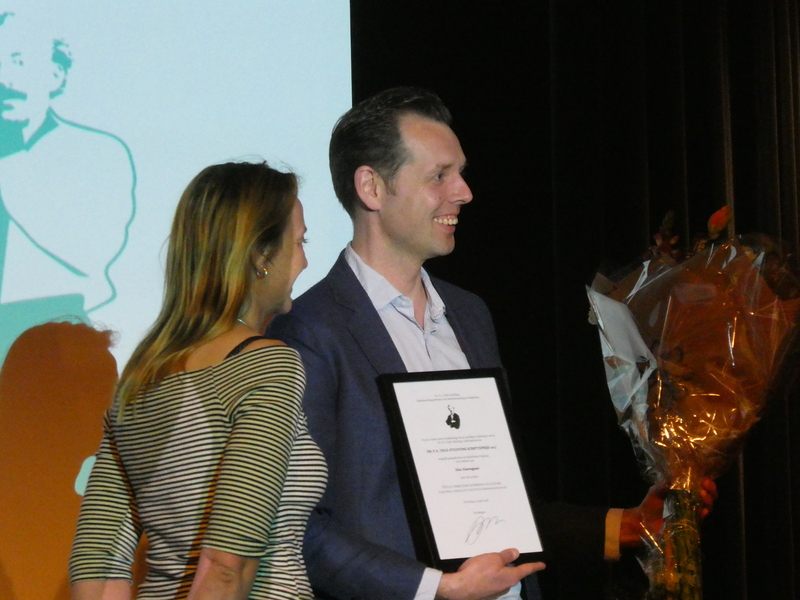 Tiele Foundation awarded my thesis Dutch connections in Swedish collections with their annual Tiele thesis award. I am obviously proud, pleased and honoured! The prize was handed out the annual Tiele-day of the Dr. P.A. Tiele Foundation (organization for the advancement of book science in the Netherlands) in the auditorium of the Koninklijke Bibliotheek, National Library of the Netherlands, Friday 20 April 2018. The flattering report of the jury specifically mentions the amount of field work conducted, the combination of traditional methods and big data analysis, the source criticism and narrative qualities of the thesis. Their final plea to conduct similar research in Denmark, Poland, the Baltic States and other areas was received with great enthusiasm by the attendees. I wrote my thesis as part of the Book and Digital Media Studies program at Leiden University. The aim of my thesis is to give insight into the Dutch books that are found in Swedish collections, analyze them in a bibliographical, material and contextual way, and show how underlying patterns of cultural exchange between the Dutch Republic and Sweden are connected to specific historical collections in Swedish libraries. Research of this kind could not have been undertaken without the aid of the Koninklijke Bibliotheek, National Library of the Netherlands, the Short-Title Catalogue, Netherlands, and my friends and colleagues at Uppsala University Library, Västerås Stadsbibliotek, Skoklosters Slotts Bibliotek, Stockholm University Library, Lund University Library and pretty much every other Swedish research library. The award ceremony was the conclusion of a day with five lectures on material evidence in manuscripts, printed books and on the web. Irene van Renswoude, researcher at Huygens ING (KNAW), demonstrated how marginal annotations in Medieval manuscripts reveal how texts were read and understood. Marieke van Delft, curator of early printed collections at the National Library of the Netherlands, explained the Material Evidence in Incunabula project, with the help of her interns Gerline Sonneveld and Lotte Paulides. Ad Leerintveld, former curator of modern manuscripts at the National Library of the Netherlands, told about his quest for books from the library of Constantijn Huygens. Suzan Folkerts, curator at the Athenaeumbibliotheek in Deventer, explained the background of the exposition De lezer aan het woord. Kees Teszelszky, curator of digital collections at the National Library of the Netherlands, explained the peculiarities of material evidence and traces of use on the World Wide Web.